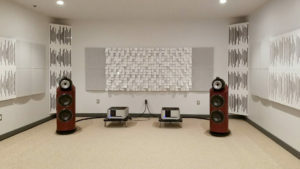 We talked about performance speakers and the importance of proper speaker placement in Part 1 of our Listening Room feature. We also covered the acoustic properties and critical dimensions of the room design. Now, let’s dive into what drives the sound! The heart of your system driving sound to each channel is the amplifier. Unlike your Home Theater’s AV Receiver that houses an all-in-one pre-amp, amplifier and processor for surround sound, hi-end audio systems have dedicated amplifiers, often one per channel. A more sophisticated set-up will have 2-way or 3-way amps that support each speaker. A pre-amp serves as the input device. It will convert signals from all audio sources such as a tuner, turntable and streaming devices to the signal that the amp wants. It’s essential that the amplifier be matched to the specifications of the speaker to provide optimal output. LaScala can guide you through your choices and design to your listening preferences. Our go-to is Classé, part of the B&W Group. 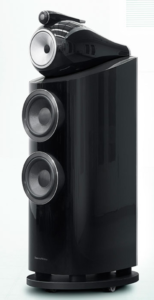 Their line of components offers exquisite sound to complement any hi-end audio system. Check out this recent review of the Sigma 2200i integrated amplifier by Stereophile. It is common knowledge that HDMI Cables are required to pass 4K and hi-end audio has similar requirements. Like video, quality cables are recommended for a solid, clean connection. That doesn’t necessarily mean the most expensive, just of good quality and appropriately sized for the given application. We can calculate the appropriate gauge cable that will deliver the necessary wattage to the speaker based on the distance. As for the connectors, gold are preferred over silver or other metallic. Locking connectors are a good choice for equipment that is seldom moved. Having sufficient, clean power is paramount to the sound quality. Every AV system needs a name brand, purposely built, surge protector. Surge protection will remove artifacts from your power, filtering out spikes and dips. Insufficient power can make the amplifiers put out harmonics that will “color” the sound, creating unwanted distortion. Once the system has been designed and the components selected, the next step is installation and commissioning. Measuring and testing the room’s characteristics, reverb, etc., we’ll “tune” the room to enable undistorted sound. By adjusting equalization (EQ), gain structure and speaker placement, we target a flat frequency response. We often hear that a turntable’s needle against vinyl is the only way to listen to music. It can be argued that the harmonic distortion created introduces a mild alteration that is perceived by many as warmth. The pops and crackles the needle yields evoke a “vintage” sense that some find pleasing and quite authentic. However, according to Mark Slee of Facebook, “In terms of fidelity and accuracy of sonic reproduction, CDs outperform vinyl in significant ways. With that said, there are sonic artifacts and emotional attachments with vinyl that many find pleasing. This creates a preference for vinyl – which some would describe as better, but this is a subjective quality as measured by the ear of the beholder.” With turntable sales up 16%, there’s apparently some “old schoolers” out there that agree. The higher the bit rate of the audio, the more accurate the sound. Analog is uncompressed and the format truest to form. Overly processed audio, on the other hand, can mask or cancel parts of the music, eliminating the ability to hear everything as it was mastered. All things being equal, the more information a format can transmit, the better the sound produced. For the best listening experience, the sound transmitted should pass through quality cabling and components and be listened to in a space that is purposefully designed to capture every nuance. Are you ready to hear what you’ve been missing? Let our award-winning team at LaScala help design or retrofit your personal listening space and enjoy music as it was intended to be! What bitrate is needed to sound like analog FM? Men aren’t the only ones to enjoy their personal space. 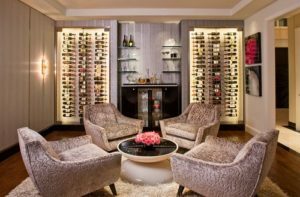 She Sheds, Woman Caves, Lady Caves are throwing the man cave a “curve.” Feeling a need to escape the chaos and disconnect from the disruptive, hyper-connected world, the woman cave provides a soft sanctuary that continues to grow in popularity. Despite all the talk of “disconnecting”, many technologies can actually add comfort, convenience and the fun-factor to the space that is “for girls only!” Here’s some things to keep in mind as you contemplate designing your personal corner of the world. This is where the creativity begins. She caves are as varied as their female occupants. A spare bedroom with sunny windows that look out across the harbor may serve as a charming, relaxing haven while an outdoor she-shed (a transformed utility shed) may suit the clever crafter or budding artist quite well. With a little renovating, the attic could become the perfect refuge for the creative writer or provide some quiet “me-time” of yoga. Even a generously-sized closet or dressing room can become a cozy reading nook and, of course, the basement can make the ultimate gal-pal hangout, complete with wine frig and big screen. So, what’s your plan? Your space may require some outfitting or updates to make it comfortable and offer the amenities you desire. Disconnecting doesn’t necessarily mean a space void of any and all connectivity either. If you’re a fitness fanatic or serious music lover, you’ll want your she cave decked out with a nice sound system and HVAC control. The work-from-home entrepreneur will need to rely on a solid, secure network and the wine enthusiast may wish to consult her eSommelier or favorite Vivino app. Additional smart technologies such as lighting and shade control, remote-controlled fireplaces and water features and user-friendly access to music or video streaming (yes, Chic-flicks!) can actually make things simpler and more comfortable. And, while you may not want disruptive emails in your sanctuary, you do want to be reached if needed – safety first! And speaking of safety, nothing is more “glam” than security – both physically and digitally. Home technology can help you keep an eye on things – the front door, the crib-cam – which is comforting. Automating tasks such as locking all the doors, lowering all the window shades and turning on the alarm can instill a sense of calm after a chaotic day. No matter the look or theme of your space, properly planned technologies will not distract from your Zen. Whether working with your designer or putting the space together on your own, we can help by introducing you to gorgeous framed artwork that lifts to reveal your on-wall LCD and speakers that disguise themselves into the ceiling or wall without detracting from the décor. And imagine replacing that unsightly bank of light switches with an elegant keypad or touchscreen! So, curl up on your chaise, grab your tablet or mirror your laptop on the big screen and scroll through these inspired spaces. Imagine your perfect little getaway from the everyday and give us a call. Mom cave, shabby chic she shack…whatever suits you, and let’s get started! Hear the Music. Really Hear it. 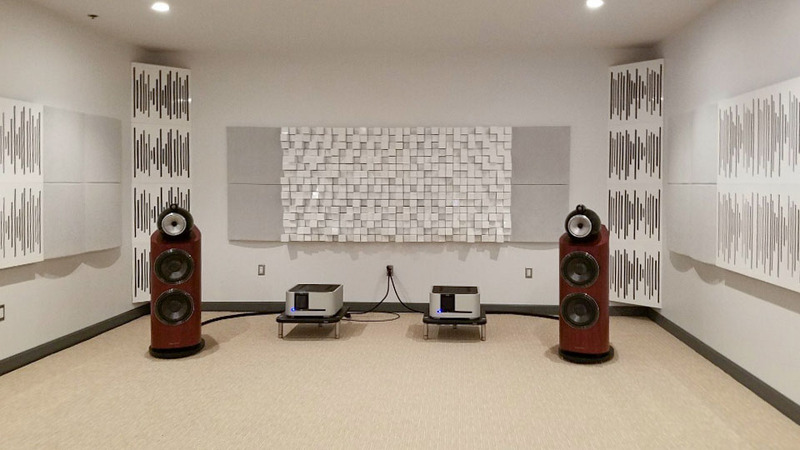 “I’ve listened to that song a thousand times and I’m hearing things I’ve never heard before.” That’s the definition of your perfect Listening Room. While our world of listening has transformed dramatically over the last decade, all that matters is what you want to hear. 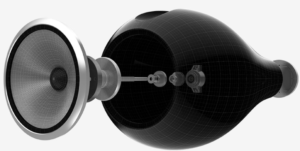 The science and mathematics are real, as are the hi-end audio components. The rest is subjective. Loudspeakers convert electrical impulses into sound. Depending on the dimensions of the room, as well as the listener’s preferences, a well-designed audio system will transmit the desired range of frequencies (note that it may not be the widest range). Some audiophiles swear by 2-channel, with speakers positioned a calculated distance apart and at an optimal distance from the listener, facing the listener for a 2 dimensional listening experience. The 2-channel system creates a virtual sound stage. When professionally set-up, the listener is able to close his/her eyes and actually pick out exactly where, on the “stage”, that musician was positioned. Unlike viewing a movie, there is no need for various sounds (voice, music, effects) to “follow” around the room, so rear speakers or a full surround sound system are not desired. In fact, some find it unnatural for instruments to be heard behind them. The perfect speaker system, in the perfect acoustically treated room, will reproduce the sound as authentically as possible. However, while science can measure all facets of sound, the listening experience is quite personal and our passion for particular brands is rather cult-like. We, of course, have our favorites too. Equally as important to the components is the environment. 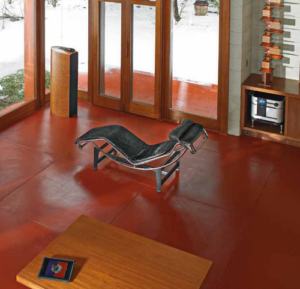 The ideal listening room will be free of ambient noise and other distractions. Acoustic treatments will absorb the hum of the HVAC and rattling water pipes. The space will be free of harsh lighting, filled only with soft, relaxing light and there will be no capacity for video. This combination of exceptional components producing nearly flawless sound and the distraction-free environment, will allow the listener to hear subtle artifacts in the music that were previously unnoticed. The room’s furnishings and physical dimensions are essential to the experience. The proper room requires some soft surfaces – some will say that even a glass coffee table or leather couch is not suitable as they will reflect sound, opting instead for fabric seating. The height of the seat back is recommended to be below the listener’s ear level, allowing unobstructed hearing without reflection. The single seat should be positioned in what will be known as the “sweet spot” or “money seat,” as determined by the engineer’s calculations. The calculations for the room itself are also of great importance. To determine an acoustically accurate room for optimal listening, audio engineers employ the Bonello Graph, a method of calculating the ideal room ratio of dimension and volume, explained here by AcousticFields.com. In the audiophile world, this is also referred to as the acoustic amoeba. Are you an audiophile or serious music lover that wants to experience all that the music has to offer? Hearing is believing! Let’s set up an in-home consultation and schedule a demo – you can even bring your own music. And stay-tuned. Part 2 will cover amplification, calibration, connectivity and content. Did you know Neil Young was launching a high-quality music streaming service?